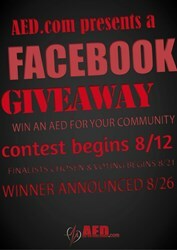 AED.com has selected six finalists for their Facebook Giveaway. Facebook fans are now encouraged to vote for their favorite finalist until Monday, August 26th. We felt like this was a great opportunity to interact with and reward our loyal Facebook following. I think we have a great set of finalists, and I am certain that the eventual winner will make excellent use of the AED. Last week, AED.com announced a Facebook Giveaway offering Facebook Fans a chance to win an AED for an organization they work with. The giveaway generated dozens of entries from individuals representing schools, churches, EMS units, and other community organizations. From this application pool, six finalists have been chosen. Facebook Fans are now encouraged to vote for their favorite finalist from now until Monday, August 26th at 8 a.m. Central Time. The six finalists are Weleetka Graham EMS, Phoenix Nursing and Rehab, Pierce County Schools, Scott County Athletics, Montour Falls Library, and Family Life Center. The finalist receiving the most votes by Monday morning will be awarded a free AED courtesy of AED.com. The giveaway was designed to provide an automated external defibrillator to a deserving organization as well as to raise awareness for the great need for these devices. Moriah Lutz-Tveite, Marketing Production Coordinator for AED.com, states, "We felt like this was a great opportunity to interact with and reward our loyal Facebook following. I think we have a great set of finalists, and I am certain that the eventual winner will make excellent use of the AED."